April was a busy month for Beer and I. I recently taught a beginners homebrewing class at the Bellingham Technical College (BTC). 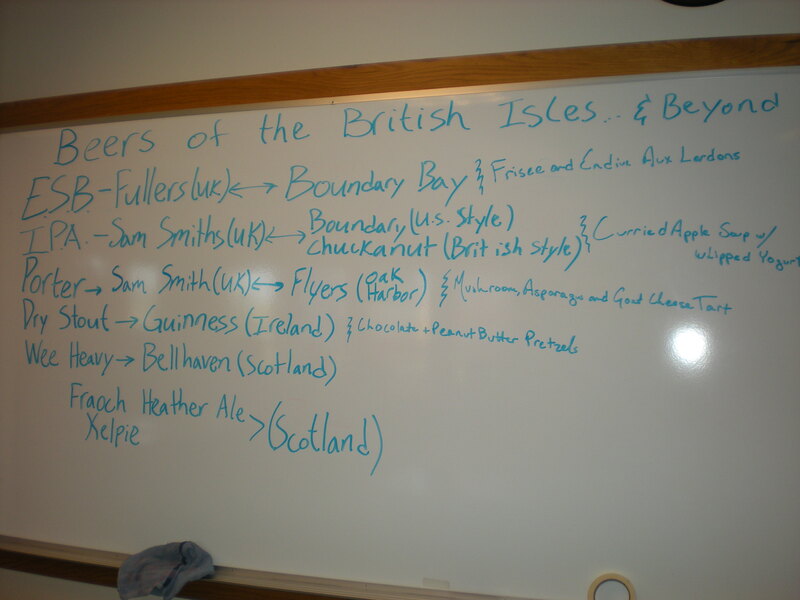 I also taught a Beers of the British Isles tasting class, which was a lot of fun. 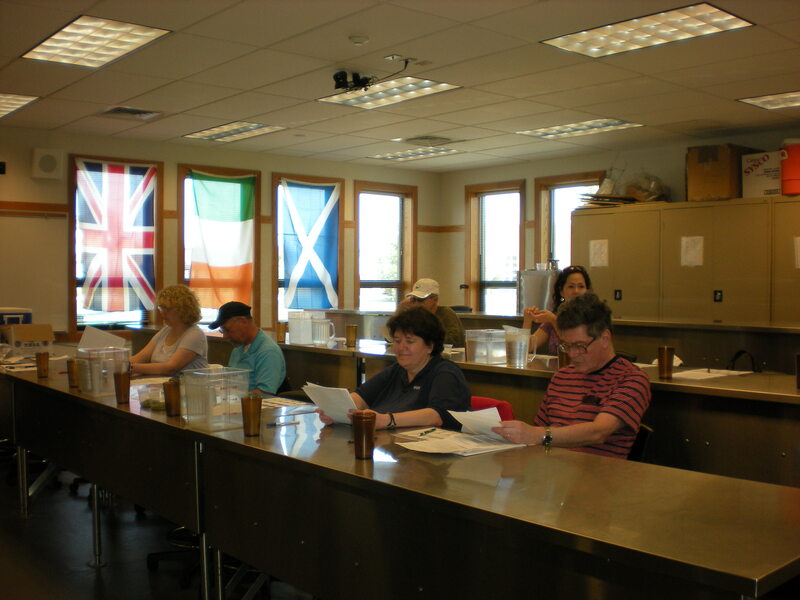 For this class the idea was to have classic beers from England, Scotland and Ireland, then compare them with American examples of the same styles. This not only shows how and why craft beer took off in America, but how these classic beer styles have evoloved into new styles of their own. At the World Beer Cup for example there are separate sub-categories for English IPA and American IPA. I hung up some flags and maps, put on some Irish and Scottish music and we had a great time. Another plus, for the first time we had a chef preparing food pairings right there in the room. 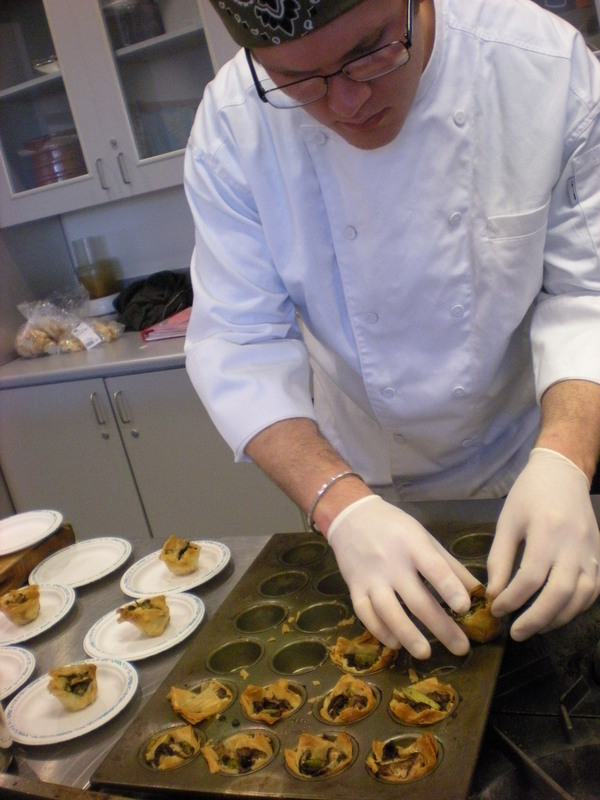 Matt Hansen is the kitchen Manager at Boundary Bay and is an BTC Culinary alumni. His pairings were both great tasting and clever. For example he paired a Indian curry with the India Pale Ales. Hopefully Matt and I can join forces together for my next beer tasting class, which, probably won’t be until the Winter quarter. I’m taking the Summer and Fall quarters off from teaching any classes. I’m open to ideas until then so if you have a suggestion, post it on this blog. April was topped off with the annual April Brews Day beer festival, which is a fundraiser for the Max Higbee Center. I made two special beers for this event: Ginger-Peach Blonde Ale, and Vanilla Bourbon Oak Aged Imperial Stout. The stout turned out really good, but I think last years was better, I will definitely do it again next year. The Ginger-Peach is always evolving and I think I’ll need to get more peach into it next year. If you tried either of these and want to give me some feedback for next year, please post it on the blog here. 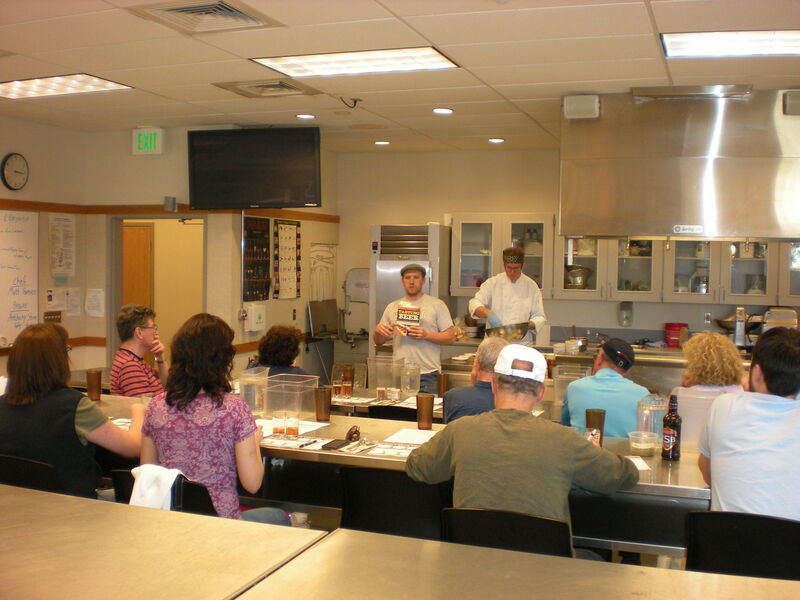 Thanks to everyone who attended the April Brews Day and who came to my classes. Without the support of beer lovers in Bellingham, there would be no craft beer here. I’ve had a number of people asking me about beer temperature lately. I know that people want a simple answer like, “40 degrees,” but different beer styles are best served at different temperatures. We’ve been told by commercials for years that beer is best when it’s ice cold. Unfortunately when beer is too cold it sorta numbs our taste buds so we won’t be able to taste as much. This isn’t a problem if the beer doesn’t have much to taste to begin with, but for more flavorful beers you’d be missing out. So here at Boundary Bay Brewery, our beer might seem a little warmer than at some other bars, but we think the flavor is the most important part. We don’t want you to miss a thing! There is a great book by Randy Mosher called “Tasting Beer” that has some great information on beer serving temperatures. He says that in general lager beers should be about 40F and ales should be served between 50 – 55F. Another general rule he suggests is stronger and darker beers should be served warmer than weaker and/or lighter colored beers. I stole a graphic from his book to help illustrate this point. Speaking of beer and temperature, I just got back from a trip to the frozen mid-west to visit my in-laws. It is a very small town but there is a small group of about 6 to 9 dedicated homebrewers there. The day I arrived they had brewed 60 gallons of beer together and had bought a bourbon barrel to age it in. It’s hard to find beer there beyond the usual Nascar beers, so the homebrew I tried was so good it reminded me why it is such a popular hobby. It also made me realize how much I take for granted the awesome beer selection we have in the stores here compared to much of the country. Not to mention that we have two award winning breweries in town, which makes life in Bellingham so much sweeter. When we went to Iowa City to visit my brother in-law I got to have some of Goose Islands great IPA and some other mid-west beers. Whenever I travel I love to try the local beers especially ones that I can’t get over here. If all this talk of cold beer and cold weather is making you thirsty, you might want to sign up for my winter beer tasting class at the Bellingham Technical College on Sat. Feb. 19th. We’ll be tasting some barley wines, strong ales and other winter warmers from local and abroad. We had a great time at the last beer tasting class in January. I’ll have one more beer tasting class in April which will focus on beer styles from Ireland, Scotland and England. We’ll try iconic examples from their country of origin and then compare them to American examples, which I think will be every informative and fun to do. I will also have one more beginner’s homebrewing class in April as well which has been well attended the last two times I’ve done it. I know I’ve had a few people ask about a class on all-grain brewing but there are some logistical issues like class time that have kept it from happening so far. Wherever you are, and whatever temperature you’re at, I hope you stay warm this winter sharing good beer with great company. Cheers! New Year’s is a kind of weird holiday. When my wife worked in the corporate world she used to get half of New Year’s Eve off paid and all of New Year’s Day off paid. Basically New Year’s Day is “Hangover Day” and nobody wants to work. How would my boss feel if I walked in the office on March 17th and said, “I’m leaving early today to go out and drink heavily. I want you to pay me for the rest of today, and tomorrow because I’ll be too hung over to work.” If my boss complained I could play the discrimination card because it’s Saint Patrick’s day and that is how I celebrate my cultural heritage. Why is New Year’s day a paid hangover day (for people who get paid holidays, that is) but the day after St.Patrick’s day and Cinco De Mayo aren’t? I know a few people who’d never come to work if we got paid days off for hangovers. I always thought it was weird that the precedent people want to set for their entire year is getting totally sloshed and waking up feeling miserable. It’s no wonder that people make resolutions to cut back on their drinking the next day. If you’ve made a resolution to drink better beer and/or to learn more about beer in 2011, please come join me at the Bellingham Technical College for some beer tastings. On Jan.15th we’re doing an introduction to Craft Beer Tasting with food pairings. February 22nd is a Winter Beer Tasting class with a number of local and imported strong ales, barley wines, and other winter warmers. In April I will be teaching a beginner’s homebrew class again and a new Beer of the British Isles tasting class which should be really fun to do. 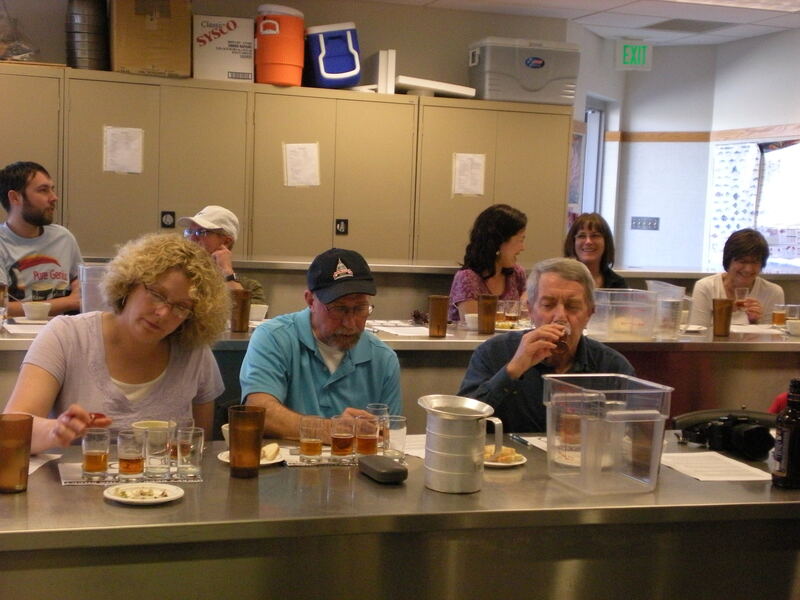 For more info on the classes check out our Bellingham’s Best Beer blog. Wishing you a very happy and healthy 2011, Cheers! Editor’s Note: I was really hungover on New Year’s Day and was checking my email on my iPhone in one of the few Cafes open (Thank you for the coffee, Mount Bakery!). Anthony had just sent me this blog to post and a few things went through my mind. One was, “What the hell is Anthony doing writing a blog at 9am on New Year’s Day?” and “I wish I was getting paid today” and “Yep, I feel pretty stupid about starting my new year with a hangover”. Then I forgot about posting his blog it until today. Sorry Anthony.